The screenshot above shows yet more refinement on the world map. The numbers aren't shown all over the place on it (unless you hold the Shift key, as with planet names in AI War), and the color for a previously-visited region is now green instead of white, making it much easier to see. The positioning of the numbers and icons is also now better, and hostile regions now show up with red numbers (not pictured). Phil has also done some great new "macro-game icons" for regions for us. 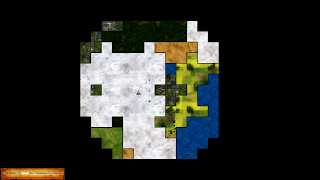 The one you can see above is the settlement icon, denoting that region contains a settlement. Most of these macro-game locations aren't visible until either you've found them yourself or an NPC explorer has found them. 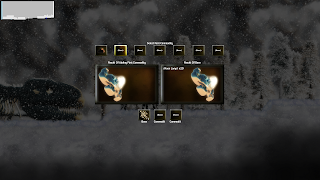 But things like possible wind shelter sites, evil out posts, and overlord keeps all now have icons. This next screenshot is the first time we've actually shown the in-game screens in over a month. As you can see, visually a lot has changed with the HUD. There's a few new indicators relating to the new mouse-based controls, but I'll talk about those another time. The game now has full mouse+keyboard, keyboard-only, and gamepad support -- all with re-mappable keys -- if I haven't mentioned that before. The biggest change to the HUD, of course, is the minimap. It's now shown in a different style, and at the top of the screen instead of the bottom. Via your settings screen, you can actually scale it up and down now; since I'm playing at 1080p, I've got it scaled to about 2x normal, but for smaller screens it can be equivalently smaller. There's tons more information in the minimap now, and you can also smoothly scale it up to fill most of your screen for detailed looking-at by hitting the M key. Simply tap M again to scale the chunk map back down into minimap size. Note that there are still some color tweaks I need to make to the unexplored color and so on on the minimap. The brown is not quite the best color now that the background map-styling has been removed, but I just haven't gotten around to changing that color yet. Two other things you might notice in that screenshot are... the rhinos! 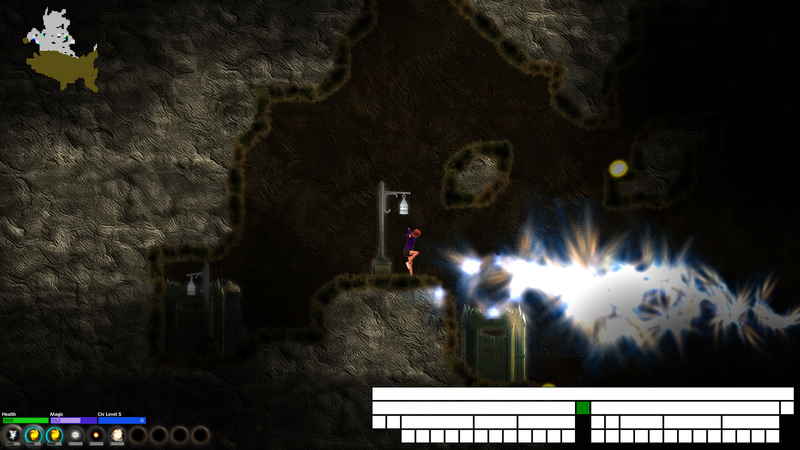 These are a new form of enemy that run really fast along surface areas, goring you if you get in the way. There are also green spell scrolls that you can craft that let you summon your own friendly rhinos, which is pretty cool -- they go bashing through all the enemies they encounter. You'll also notice that my character is standing on a floating wooden platform. That is a "medium" sized platform, and there are also small and large versions. These can be crafted out of any form of gem dust plus some cedar logs, with the help of an architect workbench. I believe that you get 50 platforms per each log plus dust. The default is the medium platforms, but you can get the large or small versions by adding easy-to-find secondary ingredients if you like. 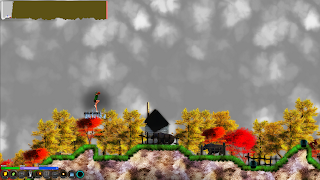 The purpose of wooden platforms is mainly to help you get around underground -- you can place these with ease with the mouse in particular, and then use them for jumping-on. They are only solid to land on, so you can jump straight up through the bottom of them, which is handy; and enemies don't hit them at all. Neither do spells, same as with trees and other background objects. But, as with trees and background objects, if you want to destroy them, you can use something like the Fire Touch spell to do so. As you progress through the game you'll get access to spells like Ride The Lightning, which was shown in the last video. But early on in, you need to rely on platforms and the like when you go spelunking. In this case I've actually placed the platform above ground, and it's keeping me safe from the rhinos while I use a Restore Magic scroll (that's the blue lines showing on top of the platform, as I took the screenshot right as that started). 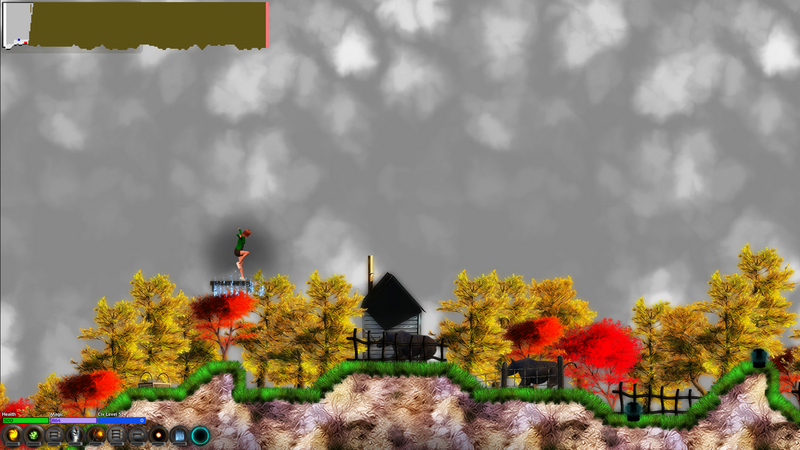 Each new character also starts with a healthy dose of wooden platforms, as they are something you don't want to get caught without. But even if you run out while exploring underground, if you can find a boss area and then use the "teleport tunnels" (temporary name for that fast-travel feature), you can get back to the first surface chunk of the region and go visit an architect bench. More on all that later, but that's a bit of info anyway. I can only partially show this particular interface at the moment because it's early in that particular world and I don't have the needed research done to actually build crests. 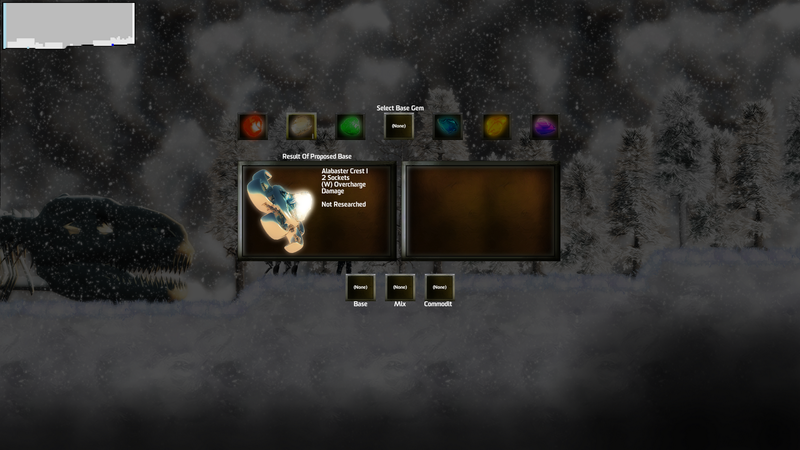 But this is a general view of the crafting interface, which uses large descriptive "cards" to show you what you're building, and which has either a row of gems, dust, or commodities at the top of the screen. Down at the very bottom you can see what you've combined thus far. At the moment, the combinations are always either gem or dust, and then other stuff. For crests it's one, two, or three gems. That is, a Base Gem, plus optionally a Mix Gem, and then optionally a Catalyst Gem (but only if you have a Mix already). There are three kinds of crafting that use the Base+Mix+Catalyst pattern (crest, spellshaper, enchant) and three that use the Gem/Dust+Commodity+Commodity pattern (spellgem, spellscroll, architect). For those other kinds of crafting, you use one gem OR one dust, plus 0-2 commodities. It's really straightforward and quick to use, and doesn't require memorization or an external wiki. You can easily check your inventory of commodities/gems/dust at any time, by the way, and there will also be some other in-game shortcuts to make looking at the various dimensions of this data as simple as possible. So, in the paragraphs above I did mention research -- so I'll expand on that a little bit. Basically, when you start out in a new world there is very little that crafters actually know how to make. They also don't have access to very many or very good raw materials. As you explore around, of course you'll find more and better raw materials, but you'll also find "books of magic" that you can use to research new spells, crests, scrolls, traps, mechanical devices, buildings, and so on. We'll get into the mechanics of how you turn in books of magic, and what the research works like, in the next video. The card graphics here are showing the crest image, which is a temporary thing, so please ignore that. However, what you can see here is that I've used some white opal dust that I have (see at the bottom where my base is selected), and now the provisional thing that I will craft is 20 moon lamps (see the card on the right). Up at the top of the screen, I can either add in some cedar logs to my white opal dust to get wood platforms, or I can choose "none" to just finish and get my 20 moon lamps in exchange for one unit of white opal dust. We'll show crafting in greater detail the next full diary that we do, including video of it in action, but I figured it was a good time to at least show you some of the interface. It is a rather central part of the game, after all! So I'll warn you right up front with this last screenshot that there's a lot of partially-complete stuff you're looking at there. First of all, there's a bug that is causing the darkness to be too dark in the compiled versions of the game, but which isn't causing that when I run the game in the unity editor. That is... bizarre, to say the least, and it's something I need to look into more. But that's why the darkness was so incredibly thick in the last video Erik did, and why I haven't shown more screenshots since. At any rate, though, you can see an example of a partly-explored chunk map of an underground section in the top left. But ALSO, you can see a very early working example of a dungeon map in the bottom right. The graphics and styling on the dungeon map are very placeholder, but the green node is where I'm currently located, and all the white nodes are the other chunks in that same dungeon. The cross-connections aren't shown yet, and that's one of many things we're still working on with the dungeon and region maps. But what's really exciting is that you can easily pop open the dungeon or region map with period or comma respectively, and you can close them just as quickly. But if you're running at a large screen and for some reason want to have their overlay up while you play, then you can turn them on, and even scroll them around so they are wherever you want on the screen. That's pretty handy! We're working toward the point where we have enough things completed on all the various fronts to show you some longer gameplay videos that will really capture how the early game goes. And we'll have more to show on interiors, dungeons, bosses, scouting/exploration, settlements, crafting... a whole long list of stuff. But since that's really requiring completion of so many different parts of the game, that's what the delay is in our showing the next video. Similarly, if we're going to be hitting beta in August it's going to be very late August at this stage. It might be September. The project is still roughly on schedule for a October/November launch from the look of things, but we keep realizing that "oh, we can't leave that out of our first beta release or people will be disappointed," and so that's made it so that the first published will be a lot closer to the 1.0 "finished" version than we'd been originally planning. Of course, I put finished in quotes, because as with AI War this game is intended to grow and evolve immensely during the beta period and post-1.0. We've just got to have a nearly-complete foundation for all of the basic components of the game before we start letting people play it; first impressions being rather important and all that. Anyway, stay tuned! We'll have more for you in 2-3 weeks, hopefully with a video that time!